When we started setting up our son's Galaxy Nexus for his birthday, I started Googling for the best way to set up parental controls. What I found was a ton of apps for younger children. These apps are designed for a mom or dad who hands their phone over to the young child and doesn't want them buying crazy apps from the market, making unexpected phone calls, finding stuff on the phone or changing settings. 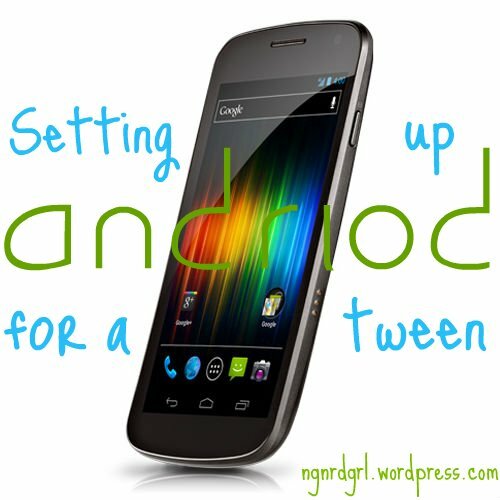 What I didn't find was any suggestions on what to do for a tween with a new smart phone. I normally would cringe over the idea of a 12-year-old having a baddass cell phone, but it really does make sense for our situation. Living 2,300 miles from him means we need to do everything in our power to keep the lines of communication open with him. He had been begging for a phone from both us and his mom, so it was really a win-win situation. I go through many of the reasons why we got him a phone in my Gift Guide, so I won't keep rehashing our reasons. Set up Family Allowance through T-Mobile: This enables us to give him allowances for minutes, messages and downloads as well as set up always allowed numbers, restricted numbers and curfews on the phone. We set him up for 300 minutes per month out of our 1000 minutes total. We also set up his family members as "always allowed," which means after he hits 300 minutes he will still be able to call mom, but won't be allowed to call friends (or future girl friends). The Family Allowance settings also allows you to set up times when the child is allowed or not allowed to use his phone. For instance, you could set it up to not be used during school hours and late at night. This would prevent phone calls, text and I think data usage during the designated hours. We did not set this up but its nice to know that it is there if needed. The Family Allowance settings are unlocked for $5 per month through T-Mobile (check with other carriers if they have an equivalent program). Check Google Wallet: Sign in through the Gmail account set up on the phone and check Google Wallet for billing methods. I think the first time you buy something on the market or set up a credit card, carrier billing shows up on Google Wallet. I believe you can then delete carrier billing to prevent it from showing up as an option on the market. I haven't fully tested this and don't know if it will re-show up in the future. However, if you want to buy your child some apps with a credit card, this is the place to go to delete the credit cards afterwards so the youth can't buy things on their own. Webguard through the carrier: We turned on Webguard for his account to restrict high maturity, adult content through the browser. This was free through T-Mobile. 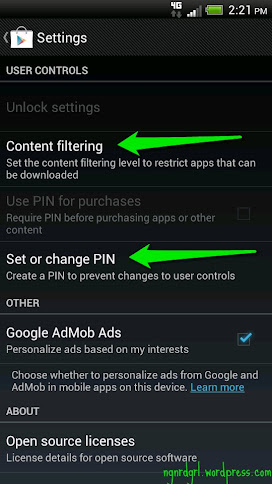 Set up Google Play Market Content Filtering: This step has to be done through the phone. First open up the market, go to settings then click on "content filtering." You can set up everyone, low, medium or high maturity. If you go to the Google Play Market website and take a look at different apps, it will tell you the maturity level of the app. Here is Google's descriptions of Content Ratings. We initially set it up to low maturity, then had to reset it to medium maturity. We wanted low maturity because this would restrict social apps like Facebook, but then changed it to medium as games like Minecraft are considered medium maturity. This at least still restricts adult content apps. Once you set the content filtering, click on "Set or Change Pin." This will then require a pin to change the Content Filtering level. Set a pin for purchases through Google Play Market: In this same section of the settings, you can toggle on "Use Pin for Purchases." This will require a pin before making any purchase from the market. We did not check this as we wanted him to be able to purchase games/apps with a Google Play Gift Card. This would also be a hassle for us as we don't live in the same state as him and would be redundant to our $0 data allowance. This is a good alternative if your carrier doesn't support allowances or blocking purchases with carrier billing. dad on IM or pulls down the settings pull down. Set a fun Wallpaper: Adventure Time is his favorite cartoon right now. He was Finn for Halloween this year. I downloaded a couple wallpapers for him and set one. Download Games: I set up a folder on the desktop with Angry Birds Star Wars, Angry Birds Space, and the original Angry Birds, Bad Piggies, Where's my water? and several other free games from the market. Uploaded Pictures to Picasa: I uploaded several albums from my Picasa account to his account so that the pictures would show up in his gallery but not take up space on his phone. Set up Contact Photos: I made sure to download some photos from Facebook of his mom, grandparents and aunties and set up the contact photos so that he can see them. I also put shortcuts to his mom and dad on his home screen. Set a fun photo of him as the owner of the phone: This photo will show up when he is chatting through Gtalk. It also shows up in the settings pull down in Jelly Bean. Buy a $10 Google Play Market Gift Card: We didn't buy him a gift card this time around, but we told him that these are available at the grocery store and he immediately acquired one so that he could buy games like Minecraft and Plants vs. Zombies. These are great because then no one is putting a credit card in on his phone. One of the games I wished I had set up was Draw Something. We are going to get him to download it and play it with us. Our goal with giving him a phone is to increase small interactions every day. Whether it is sending him text messages, picture messages or playing interactive games with him. A phone gives us a method to having quick but multiple interactions with him every day. It also has helped everyone reach him as he will definitely have his cool, new smart phone on him at all times with a charged battery. Do you have a teenager or preteen with a smart phone? What are some of the things you did to ensure their safety? 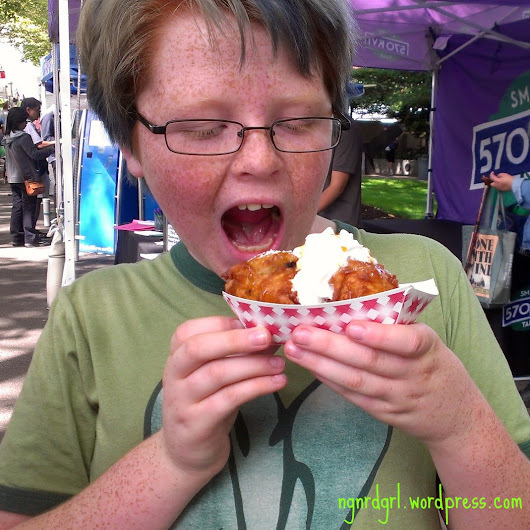 What do you think about social media and your child? It is really hard for us because we are not the main parent, so it isn't like we can be watchful. When he is here, we try to engage in conversations with him. Try to talk some of this out with him. But when he is home, he is in a completely different parenting environment. Do you have children or step children who spend the majority of their time with the other parent? Have any tips or reading suggestions for me? Here are some articles I found online about teenagers and social media. Please add your links to the comments below. Help Your Teens Play It Safe - article on Facebook for parents of teenagers. Teens on Facebook - an article written by a teenager about the addictive qualities of Facebook.